‘I knew when I met you an adventure was going to happen’ (A.A. Milne, author of Winnie-the-Pooh), and boy, has it been. Since the very first story, written in 1925, Winnie the Pooh has captured many hearts from across the world, and he continues to do so to this day. 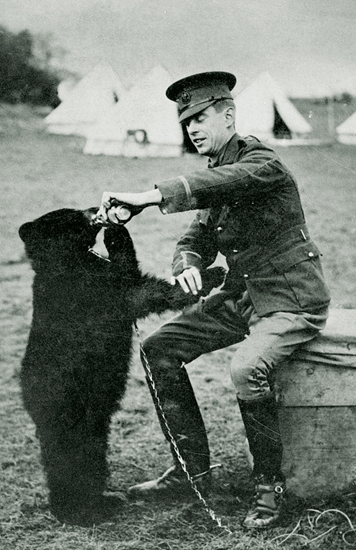 A black bear cub was purchased from a hunter by Canadian soldier Harry Colebourn during World War I. Becoming his pet and the troop’s mascot, before later residing in the London Zoological Gardens, the cub was named Winnipeg, or Winnie for short. It was here in London that Milne’s son Christopher Robin fell in love with the bear, naming his own teddy bear after her. In East Sussex lies the real-life Five Hundred Acre Wood – part of the Ashdown Forest – on which Milne based his fictional Hundred Acre Wood. Several places within the stories, including Poohsticks Bridge, Galleon’s Lap and Roo’s Sandpit, are also based on real locations within the woods where his son would regularly play at when the family would stay at their country home on the northern edge of the forest. Everyone today adores the characters Pooh, Tigger, Piglet, Eeyore, Kanga and Roo; however, they were all simply names of Milne’s son’s toy animals. Making their literary debut, the original teddy of Pooh arrived in America shortly after WWII, became a book-touring celebrity and sadly, never returned to Britain. 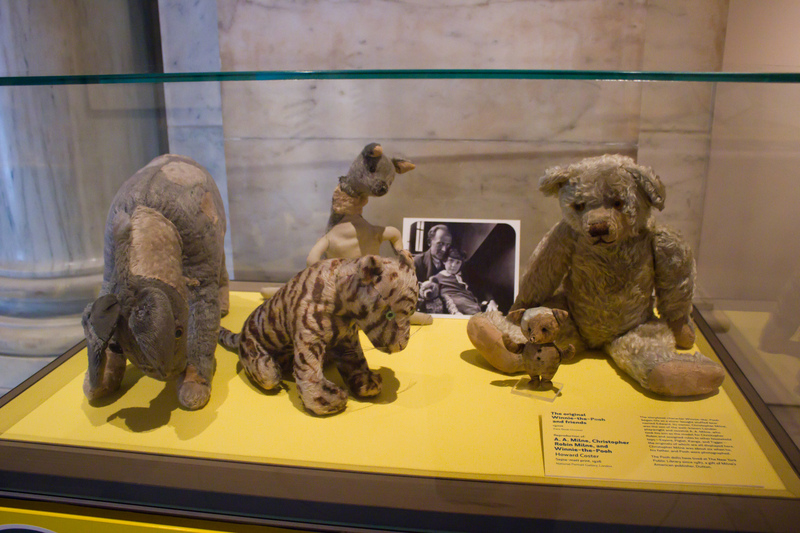 However, all the original toys are on display in a bullet-proof glass case at the New York Public Library for you to visit – except Roo, as he went missing in an apple orchard in the 1930s. Although Shepard was introduced to Milne through their mutual colleague, E.V. Lucas, Milne was reluctant to hire Shepard due to his political cartoonist background. 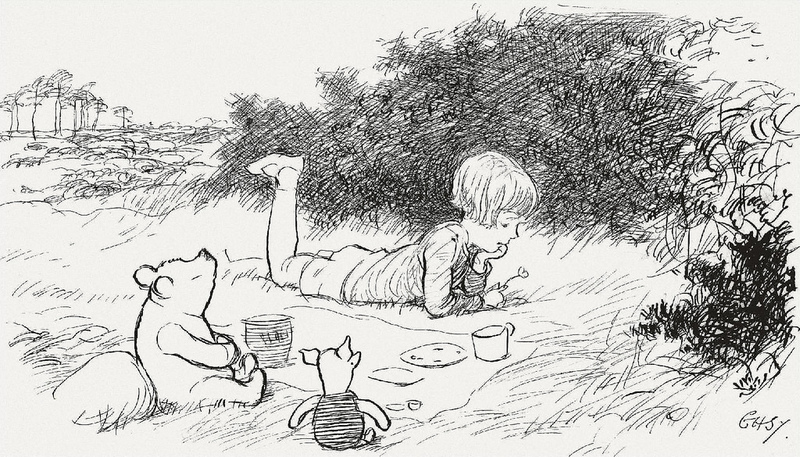 Despite this, Shepard took it upon himself to wander through Ashdown Forest – the inspiration of the Hundred Acre Wood – to create a portfolio of sketches. Presenting them to Milne after appearing at Milne’s home unannounced, he won Milne’s heart and soon after the hearts of children across the world. In December 2014, an illustration from 1928 featuring Christopher Robin, Pooh and Piglet playing Pooh-Sticks on the bridge, entitled For a long time looked at the river beneath them…, sold for £314,500 at Sotheby’s. This is the highest price to date that one of these drawings has been purchased. First sold to American producer Stephen Slesinger in January 1930 for merchandising rights in the United States and Canada, Slesinger began the creation of merchandise including toys and board games. Following this, Walt Disney set out to purchase the rights and film rights in the 60s, where Pooh has continued to live and breathe to this day. Upon purchasing the merchandising rights to Pooh for the United States and Canada, Slesinger added a red t-shirt to then-naked Pooh for an RCA Victor picture record in 1932; and by the 40s, many plush dolls were donning the now-signature red t-shirt. By 1961, Slesinger’s widow licensed the merchandise to Disney, who kept this new look. After purchasing the motion picture rights from Milne’s widow, Disney began creating a series of shorts that were released in cinemas in the late 60s. Following this, a trio of shorts constructed Pooh’s first theatrical release upon Disney’s request, The Many Adventures of Winnie the Pooh (1977), two television shows followed in the 80s, and by the 2000s, both animated movies and CGI series were released, making Pooh one of the most popular properties for Disney, alongside Mickey Mouse. And one of them is Winnie the Pooh! 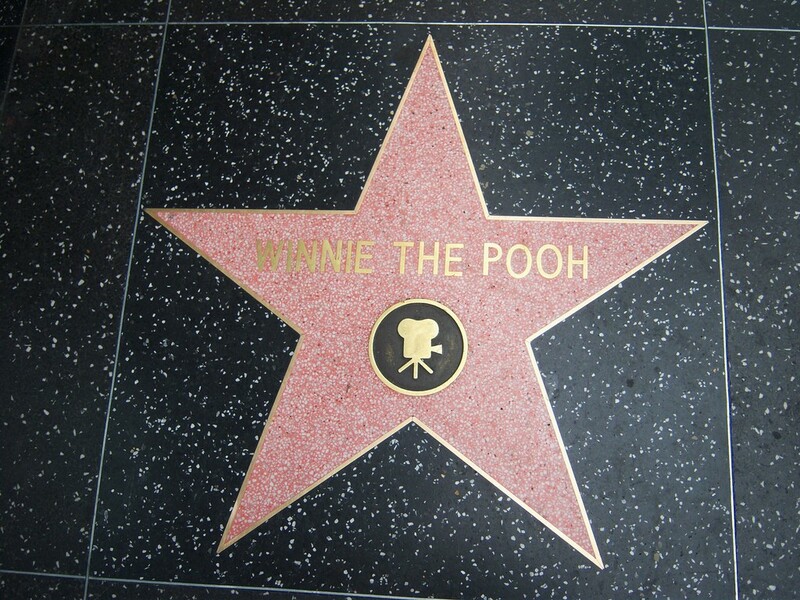 Receiving his own star in April 2006, not only did he become one of the very few fictional characters – alongside Mickey Mouse, Big Bird, Kermit the Frog and Bugs Bunny – to be awarded, but Pooh is also the only bear ever to be honoured. The real Christopher Robin, sadly, resented his father using his name in the popular books, becoming forever famed ‘as the tender little boy in the Hundred Acre Wood’. Becoming a writer himself, Christopher Robin wrote memoirs of his own life including The Enchanted Places, Beyond the World of Pooh and The Hollow On The Hill where he announced that ‘it seemed to me almost that my father had got where he was by climbing on my infant shoulders, that he had filched from me my good name and left me nothing but empty fame’. Gaining worldwide popularity, Winnie-the-Pooh has been translated into more than 50 different languages, including Afrikaans, Esperanto and Yiddish. The most successful translation and unexpected hit is the Latin version, Winnie Ille Pu (1958), by Hungarian doctor Alexander Lenard. One critic described this book as ‘the greatest book a dead language has ever known’, and in 1960, it became the first foreign-language book and only Latin book to be featured on the New York Times Best Seller List. Although we all love to see Pooh in his red t-shirt wandering through the woods, helping his friends, there’s something oddly satisfying about watching the Russian animation portrayal of Winnie. Closely following the original trilogy, the look of Winnie is drastically different from Shepard’s illustrations, however, just as cheery. Commemorating the 70th anniversary of the publication of Winnie-the-Pooh, the owner of Hartfield’s Pooh Corner, Mike Ridley, wrote out the ‘Official Pooh Corner Rules for Playing Poohsticks’ in 1996. From selecting sticks and showing them to your competitors to stating which direction you should face and how the winner is announced, the rules also remind you not to fall into the water. We know you have dreamt of playing Pooh-Sticks since you were a little kid – don’t deny it. Since 1984, people have been competing, both individually and as part of a team, in the annual World Championships of Pooh-Sticks in Oxfordshire. Although Milne introduced the world to Winnie-the-Pooh, upon gaining rights, Disney dropped the hyphens in his name, which saw a drastic rise in popularity. Thus, Pooh has since been known as Winnie the Pooh. Reading the stories as a child, the characters all seem like they are living in such an innocent world. However, an article published in the Canadian Medical Journal by SE Shea – titled ‘Pathology in the Hundred Acre Wood: a neurodevelopmental perspective on A.A. Milne’ – argues otherwise by claiming that each character represents clinical mental disorders, creating a story with a deeper meaning. The study claimed that Pooh has ADHD and OCD whilst also displaying ‘borderline intellectual functioning’ and indulging in ‘poor diet, obesity and binge eating’; Piglet has generalised anxiety disorder; Rabbit has narcissistic personality disorder; Tigger has ADHD and hyperactivity; and Eeyore with long-term chronic depression supposedly due to his ‘traumatic tail amputation’. Being super popular in Poland, a street in Warsaw is named after this friendly little bear, named ‘Ulica Kubusia Puchatka’. This 149-metre-long street gained its name in 1954 by readers who entered a competition in Express Wieczorny. There is also a street in Budapest, Micimackó utca, named after him.